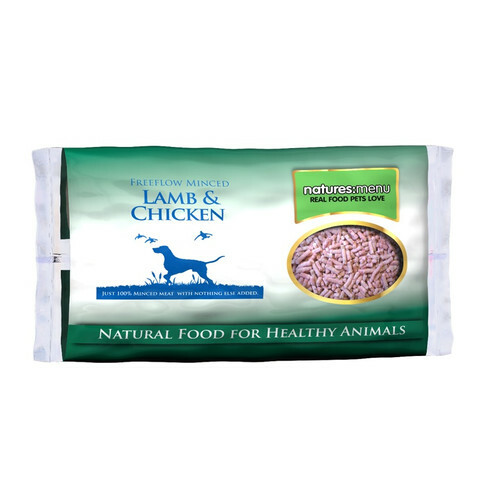 Nutritious Lamb and Chicken Blend, the fattier of all our minces and great for building a dogs weight. From human grade sources, minced and packed in individual 2kg bags. The thicker mince is named free-flow as is it so easy to use. Simply pour out the required amount. It is a lovely loose mince that when defrosted is just like your butchers best minced meats. These are simply minced whole meats with nothing added. Lamb is a complete protein and is packed with healthy Vitamin A, B Vitamins including lots of B12 plus essential minerals such as Copper, Zinc, Phosphorus and Selenium. Lamb also has a unique fat content in that over half the fat (around 60%) is the healthy unsaturated type which is actually good for the body.